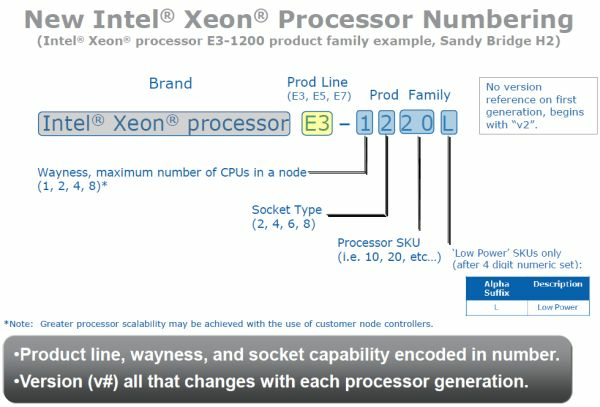 Yesterday, Intel announced that their flagship server processor, the Xeon Nehalem-EX, is being succeeded by the Xeon Westmere-EX, a process-shrinking " tick" in Intel's terminology. 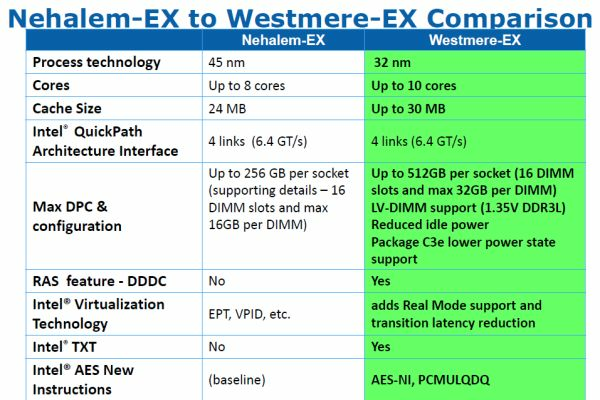 By shrinking Intel's largest Xeon to 32nm, the best Westmere-EX Xeon is now clocked 6% higher (2.4GHz versus 2.26GHz), gets two extra cores (10 versus 8) and has a 30MB L3 (instead of 24MB). As is typical for a tick, the core improvements are rather subtle. The only tangible improvement should be the improved memory controller that is capable of extracting up to 20% more bandwidth out of the same DIMMs. The Nehalem-EX was the first quad-socket Xeon that was not starved by memory bandwidth, and we expect that the Westmere-EX will perform very well in bandwidth limited HPC applications. With the launch of Westmere-EX (and Sandy Bridge on the consumer side before it), it appears Intel is finally ready to admit that their BMW-inspired naming system doesn't make any sense at all. They've promised a new, "more logical" system that will be used for the coming years. The details of the new Xeon naming system are presented in the image below. There is some BMW-ness left (e.g. the product line 3-5-7), but the numbers make more sense now. You can directly derive from the model number the maximum number of sockets, the type of the socket, and whether the CPU is low-end, midrange, or high-end. Intel also has the "L" suffix present for low power models. I'd be happy to be just low enough to make AMD drop prices on their 12 and 16 cores processors. He may be referring to the coming Bulldozers with 6 and 8 modules.